This is a guest post by Reubs Walsh. Reubs describes themselves as a pseudopansexual genderqueer. Their mother has Multiple Sclerosis, and their father has been absent since Reubs was aged 9. Reubs has Asperger’s Syndrome and has always, in some way, expressed themself as queer. Being a polyamourous queer Christian presents its challenges, but MCC is a very liberal denomination (the head of the International Fellowship is a lesbian), which helps. Reubs is currently finishing a degree in which Neuroscience has been their main option, at Oxford. “Mr Tim Loughton!” announced the Speaker of the House, and the members in the chamber roared their welcome. Mr Loughton is a former MP who was investigated over the course of 6 months by the police for allegations of racism, after his response to a Romany constituent’s complaint that the local council had described him as “unkempt,” belittled the constituent, Mr Francis. Mr Loughton reported to the house on Friday how he had provided in his letter to the constituent a “dictionary definition” of the word as “untrimmed, dishevelled and rough”, and saying that he found the description to be “eminently accurate”. He also swore at Mr Francis in the email. At this stage in proceedings I was thinking that Mr Loughton’s description of his own behaviour painted him as someone who made a mistake. I could not have been more wrong. His obvious fury at being investigated on charges of racism by the police strikes me as bizarrely elitist – his job is to represent the public, not to be above them, or the law which he has helped shape, and which governs us all – and paints him very much as the victim of a system that he subsequently described as suffering a “culture of political correctness”. It was at this point that, listening to the conversation via podcast on my walk home from a meeting, I inhaled my hot chocolate comically. Surely, surely, a privileged Caucasian Member of Parliament is not dismissing the lived experience of a racial minority who he has knowingly insulted as no more than ‘a grudge’? I fiddled with my phone to play back what I thought I couldn’t have heard correctly. It was exactly as I had feared. A Caucasian member of a parliament without a single Romany member, in a country with approximately 300,000 Romany citizens, is deigning to define for the Romany people what does or does not constitute racism or oppression. I am not saying that what he said was racist; it is not for me, as a Caucasian, to discern; but it is certainly not for him, the perpetrator of the act that distressed Mr Francis, to discern it either. The police forces and the prosecution services of this country may well lack common sense, but that is not the issue here. The issue here is that there was concrete evidence of a very serious crime being committed by Mr Loughton, and this was deserving of investigation. Mr Loughton clearly thinks racism died with apartheid. In recent news it has been reported that a woman was found guilty of disorderly conduct for an act of civil protest, and another woman was arrested in a fashion that, had the perpetrators not been police officers, would likely have been considered assault with a deadly weapon, without provocation (she vomited as a result of illness), while they harassed her in a manner that drew unnecessary attention to her trans status. The former victim (for that is what they are) was told that she must have really ‘offended’ Mr Cameron. Clearly the police and the CPS don’t mind protecting wealthy white cisgender Etonian lawmakers’ feelings. This doesn’t sound like a force paralysed or indeed misdirected by “political correctness”. This is a force out of control, through inadequate training and funding. If they were receiving the training they need, perhaps the case of Mr Loughton’s misconduct would have been heard in court. If the law reflected the needs of society, perhaps Levenson wouldn’t have been needed and perhaps Burchill’s rant wouldn’t have seen publication. But then, if the needs of society were a priority for Mr Cameron, he wouldn’t be able to receive huge party donations from corporate CEOs in Monaco, and he wouldn’t criticise Mr Milliband for listening to democratically elected Union officials. 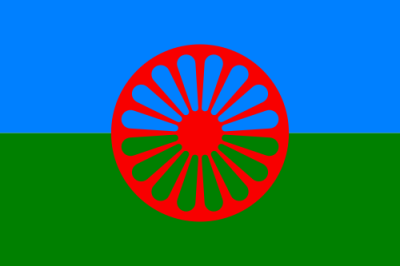 The image shows the Romany flag. The background of the flag is split horizontally, half blue, half green, and there is a red spoked wheel in the middle. It is in the public domain.